Slow Sleep – the blog of sleep: Sleeping helps you to lose weight: science has proven that! Wait a minute: so to lose weight, all I need to do is get some good sleep? That’s right, eight hours of sleep per day is enough to lose weight. Sleeping stimulates our metabolism and increases the production of leptin, the hormone that makes us feel full and helps us to lose weight. A balanced metabolism is essential to get rid of those extra pounds. When the body doesn’t get enough sleep – at least six hours per day – its hormone balance is heavily disrupted, which leads to an increased appetite, a decrease in the number of calories burned and a sluggish baseline metabolism. According to a research study conducted by Arn Eliasson on behalf of the Integrative Cardiac Health Project of the Walter Army Medical Center in Washington, nurses that have to work night shifts are susceptible to an imbalanced heart rate. In fact, when we are not able to sleep regular hours, our body mass index tends to increase. Conversely, the colleagues of those nurses who had a more stable work schedule did not have the same problem. Melatonin helps you lose weight! Melatonin, also known as the sleep hormone, is often used to help people lose weight. That’s what a study conducted by a team of researchers of the University of Granada found, according to which the hormone stimulates the production of “beige fat”, which is responsible for increasing the burning of calories and for getting rid of excess weight. Melatonin can also be taken in the form a dietary supplement, based on the dosage regimen recommended by your doctor or a pharmacist, although doctors in general recommend taking it in the form of foods that naturally contain the hormone, such as tomatoes, celery or cherries. Eating dinner early not only helps us to sleep well but also helps us to lose weight. Scheduling your daily meals at regular hours helps to improve the regularity of your body’s functions. In fact, spacing meals eight hours apart from one another stimulates the secretion of somatotropin. 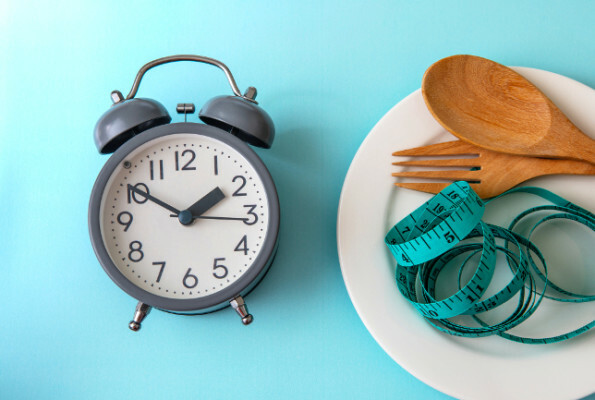 Diligently organizing your daily meals, even though uncomfortable and unpleasant at times, helps you to lose weight while you sleep, without the need to follow a strict diet. But which foods should we eat for a healthy intake of nutrients? Specialists recommend a starter consisting of complex carbohydrates, such as pasta, rice or spelt seasoned with some extra-virgin olive oil. The main course should not contain too much protein, so no white meat and, to finish things off, some fresh fruits. Doctors recommend to avoid eating fried foods, sweets or, more generally, all the foods that can cause a slow digestion. But careful, because if over-eating is a bad habit of yours, so is eating too little or even skipping a meal. In fact, the number of calories we consume at dinner should not be less than the recommended daily intake, in order to prevent the level of glucose in the blood from dropping too low. Our body needs energy even when we are asleep and if it doesn’t have enough, it warns us by waking us up in the middle of the night and disrupting our normal sleep hours. However, to stimulate weight loss at night, it is necessary to be active during the day, by practicing sports or by trying to eat healthy meals. That doesn’t necessarily mean having to spend three hours in the gym every day or having nothing but a salad for lunch or dinner, though. Getting enough movement throughout the day and having a balanced diet are an equally valid solution. In that case, an intake of proteins can prove helpful, because they are low in calories compared to fats and, unlike carbohydrates, our body transforms them directly into energy.